Following in the leaky footsteps left by the Call of Duty: Black Ops II Revolution map pack, an unconfirmed image of some promotional material found its way online today, revealing that the next add-on for Treyarch’s shooter could launch later this month. The picture of the alleged Call of Duty: Black Ops II promotional card was posted today by Twitter user @pooop123b, who claimed that a “friend” had found it at Best Buy. Naturally, this incident has caused me to re-evaluate all of my friendships, as none of them have ever resulted in me getting exclusive scoops/pictures about the next unannounced CoD map pack. 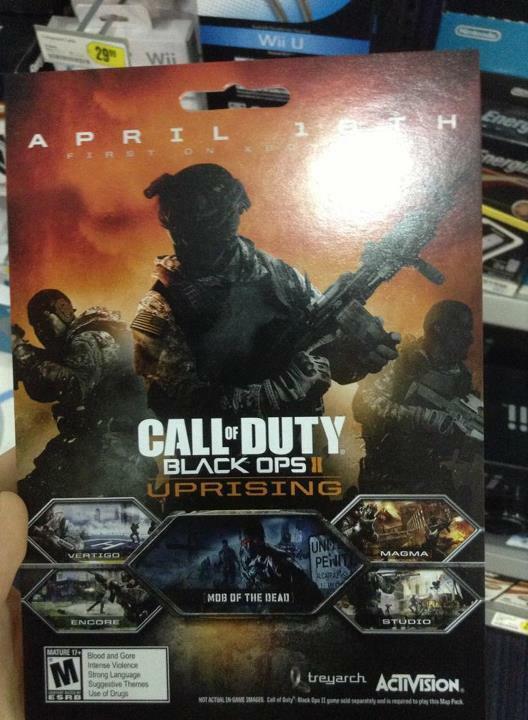 At any rate, assuming the promotional card (pictured in full below) is real, the next Call of Duty: Black Ops II downloadable content will be titled “Uprising” and will be released on the Xbox 360 (presumably as a timed exclusive) on April 16th. The DLC will contain four multiplayer maps (Vertigo, Encore, Studio, and Magma) and one Zombies map titled “Mod of the Dead”. 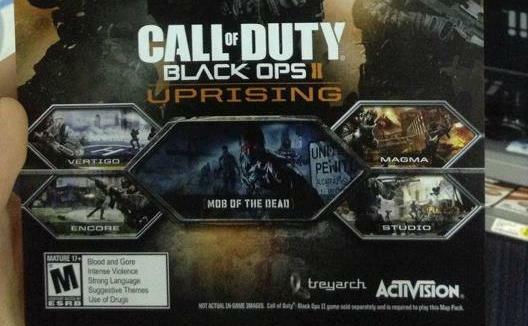 Backing up the legitimacy of the unconfirmed add-on promo card is a recent Call of Duty Online report, which details the discovery of the name “Uprising” along with mention of “Studio”, “Vertigo”, and “Mob of the Dead” within the official Call of Duty website’s source code. Neither Activision Blizzard or Treyarch have confirmed the leaked image of the Call of Duty: Black Ops II card, or source code information, so this should be considered a rumor for now. With that said, @poop123b’s promotional card is very convincing and it would be surprising (not to mention impressive) if it turned out to be a fake. Our guess is that this is the real deal, but you never know. We will keep an eye out for any official word from Activision or Treyarch on the next Call of Duty: Black Ops II DLC, and update you with all the details as soon as it is announced.